Swim training has always involved teachers, trainers, and more importantly, other people’s schedules. Thanks to the Internet, swimming teachers aren’t as imperative for the casual swimmer anymore. Now you can train on your own time and on your own terms. Google and YouTube can take you a long way. Caution and discernment are important though, so watch your sources carefully. Fortunately, many highly skilled swimmers are avid bloggers, or have published other resources. Olympic Gold Medalist, Rebecca Soni, has recently released a 30 minute audio that covers the basics of an intermediate swimmer’s workout, with tips on technique and important aspects of swimming. A variety of illustrious swimmers have also been kind enough to share their wealth of knowledge online! You can find the workout routines used by other remarkable and record setting swimmers like Michael Phelps and Ryan Lochte all over the web. There is no shortage of information, the hardest part will be sorting through all of your sources for the best tidbits. Then, you can take your mental notes to the gym pool. 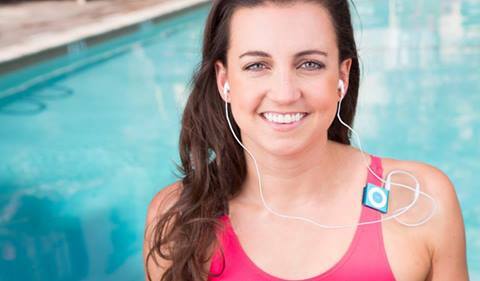 Or, you can load Rebecca Soni’s workout onto your Underwater Audio Waterproof iPod Shuffle and listen along as you swim. Even the most extensive online tutorial cannot really completely take the place of a real live trainer though. It would be worth your while to check in with a teacher from time to time. While pros can point you in the right direction and give you great ideas, there is no substitute for someone who can see your form and correct you in action. Who are your favorite trainers? Do you have a go-to online training program? Fill us in in the comment area below!